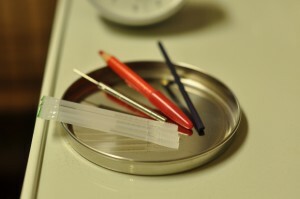 There are three kinds of needles used in Shakuju Therapy; SJ Go-shin needle (filiform needle), Sanryo-shin (three-edged needle) and Teishin needle. Three-edged needle is a needle to pierce, filiform needle is one which is able to pierce, and Teishin needle is one not to pierce. According to "Hari-kyu riron (Acupuncture and moxibustion theories)" (Toyoryohogakko-kyokai(ed. ), Ido-no-nippon-sha), the text book used in acupuncture schools in Japan, nine classical needles are classified similarly; namely, needles to tear, needles to insert, needles not to insert. Considering the border between needｌe not to pierce (Teishin needle) and needle to pierce (filiform needle), the phenomenon of puncture does not happen by contact of needle to skin, but observed when the skin cannot bear the pressure of the needle and opens a hole. It happened through the process of needle applying pressure to the surface of the skin. Therefore, filiform needle is one that can adjust various conditions from not to insert like Teishin to tear like three-edged needle. It is quite understandable that filiform needle is the most frequent used needle in the classification of needles based classical nine needles (generally speaking). 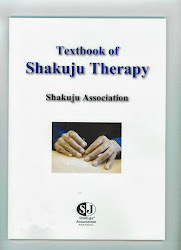 Because a SJ filiform needle is capable to correspond to various situations, needling in Shakuju therapy is up to the condition of patients, and a therapist does not judge to insert or not. When the skin of patients accepts the needle, let it puncture, if not, let it not. The effect of treatment is measured not by whether inserting or not, but by changes of reference points. But, be aware, this is for those who are skilled enough to insert, if you are beginners who do not have enough needling skill, keep on practicing aiming to insert. Here, let us think about the significance of Teishin needle. Taking account of the explanation mentioned above, pressure by a needle is presupposing insertion action, so if you apply pressure with a Teishin needle, it means that you do not make the best use of Teishin needle. That is, the treatment effect with a Teishin needle occurs only by the effect of contacting Teishin, and the pressure to the surface of the skin is only 5 gram, the weight of SJ Teishin. If you hold this 5g Teishin with both hands, the pressure to the skin is added a little more by the weight of your hands. This state of almost 5g pressure is the basic hand-positioning. Then, when you remove your thumb and index finger of Sashide (needling hand) gently, not letting the Teishin fall, the pressure to the skin gets lighter as much as the weight of hands, the skin pushes up the Teishin with its own elasticity. It is enough for Teishin to repeat this, the slight change of 1mm or something pressure can affect the body, as Kobayashi Sensei said. Of course, you can get the needling effect when you applied Teishin needle with little bit more pressure (as like a SJ filiform needle), or when you perform contact needling with a three-edged needle. However, when you choose these three differnt needles for each purpose of use, as mentioned above, as a logical consequence, it becomes easier to grasp the situation of the patient during the treatment. About using a Teishin needle without stimulation of pressure, you would feel the overwhelming effect especially when you use consciousness. It is superb! Seriously!